Healthcare reform, regulation, and R&D hurdles must be overcome to gain access to the big opportunities for the medtech industry. Today, the United States is the acknowledged world leader in medical devices and diagnostic products. With more than half of the leading global medical device companies based in the United States, the industry currently employs more than 400,000 Americans directly and 2 million people indirectly. Between 2005 and 2007, the industry created 80,000 new jobs, a workforce growth of 20% in just two years. Further, it consistently devotes significant revenues to innovation; from 2007-2009, R&D investment in medical devices increased by 9%. Not only is the industry a source of life-enhancing and life-sustaining treatments and cures, but it is also an important manufacturing industry and a driver of current and future U.S. economic growth. It is one of the few American manufacturing industries that consistently export more than it imports (exports doubled between 1998 and 2008, to $33 billion annually). A SWOT analysis of the medtech industry in 2012. The recession did little to deter hospitals and other customers from purchasing medical devices, and the anticipated economic recovery will only help the industry grow further. Medical device manufacturers will continue to benefit from the aging U.S. population, while the influx of newly insured people due to the healthcare reform bill will drive up demand for devices. However, the regulatory environment is growing more stringent, which will decrease profits and force some companies to shift functions overseas. Revenue in the device industry will not grow as quickly over the next five years, and the increasingly strict regulatory environment will remain a significant hindrance. For example, the Patient Protection and Affordable Care Act of 2010 will place an excise tax on medical devices, eating into revenue and reducing profit. Also, potential reform to the approval process for new devices will likely hamper innovation and encourage more companies to shift functions overseas. Foreign outsourcing of manufacturing, R&D, and other operations, combined with industry consolidation, is forecast to decrease the number of industry operators during the next five years. This industry has traditionally had a low level of industry concentration, with no one firm dominating. Small companies are common and typically specialize in developing niche technology, while larger players frequently seek to acquire these firms to expand their product range or gain access to a particular technology. However, during the past five years, consolidation has swept the industry, with the number of companies decreasing at an average annual rate of 5.5% to total 828. Meanwhile, emerging markets like China and Brazil will attract medical device manufacturers, as U.S. customers face more stringent Medicare reimbursement requirements and other cost-cutting pressures. There are other reasons the U.S. lead is being challenged. Gross domestic product (GDP) and unemployment numbers remain weak in much of the developed world. Western governments are faced with unprecedented levels of debt and are taking extreme measures to slash budgets. Developed nations like the United States are slipping in their capacity and capability for innovation, while emerging markets are rapidly gaining ground. This article analyzes some of the key strengths, weaknesses, opportunities, and threats currently facing the U.S. biomedical device industry. During the past 50 years, the United States has provided an ideal environment for innovation that has facilitated significant advances in medical technology. This has been due to its market size, the institutional knowledge available in both the government and in the universities, the increase in patient knowledge and demands, and its strong venture capital community. Market Size. The size of the U.S. market provides critical mass for market access and adoption of innovative products. U.S.-based companies dominate the roughly $350-billion global device industry. Thirty-two of the 46 medical technology companies with more than $1 billion in annual revenue are based in the United States. As a result, the country serves as approximately 40% of the world market for medical devices and instruments. Furthermore, the United States spends a larger percentage of its GDP and more per capita on healthcare than any other country. It is the largest healthcare market and should remain so during the next decade. Regulatory Standards. The success of the United States during recent decades stems partially from the global leadership of the FDA. The agency’s standards and guidelines to ensure safety and efficacy have instilled confidence in the industry’s products worldwide. Other countries’ regulators often wait to see FDA’s position before acting on medical technology applications. Academic Institutions. According to the Association of American Medical Colleges, the United States is home to 137 accredited medical schools and nearly 400 major teaching hospitals and maintains a clear lead in housing academic medical centers. These medical research and teaching institutions consistently rank among the best in the world and employ many of the top medical professionals in the world. The gap with the developing world is gradually narrowing as U.S.-trained physicians and scientists return to their countries of origin after completing training. Furthermore, the UK, Germany, Israel, and Japan already have world class academic and medical institutions, and have demonstrated that they can serve as the birthplace of a disproportionately large percentage of disruptive technological innovations. Rising Consumerism Empowers Patients. Medical insurance and patient preferences have also strengthened the industry. In the United States, patients’ share of total health expenditures declined from 47% in 1960 to 12% in 2011, making patients responsible for a small part of the total medical bill and many times unaware of the entire cost of a treatment. Further, the Internet has given patients easy access to healthcare information available from Web sites often supported by medical associations. As a result, U.S. patients have been engaging in partnerships with their providers in the healthcare decision-making process and have become accustomed to asking for the latest drug or device. In addition, U.S. consumers have been found to be more receptive to disruptive innovations that may help deliver better and more personalized service. The U.S. medical device industry faces the confluence of many internal challenges. Four significant weaknesses of this ecosystem are: a growing talent and development gap, a slow and cumbersome regulatory system, an excise tax on medical devices, and a lack of a permanent R&D tax credit. Human Talent. The competition for human resources is global, especially for critical human talent. Today, the United States is struggling with a large and growing talent and development gap. China has nearly the same number of research professionals as the United States and twice the number as Japan. If China were as productive per researcher as other countries, it could produce the second largest number of medical technology patents. Furthermore, the United States continues to face increasing competition for innovative talent, resources, and output. Israel and Japan lead in filing medical technology patent applications on a per capita basis, while China’s R&D expenditures as a percentage of GDP will approach U.S. levels within 10 years. As the quality of non-U.S. educational and research institutions improves, R&D funding outside the country will increase, and other developing nations’ innovative output will match and surpass that of the developed countries. The Regulatory Environment. The U.S. medical device industry is a highly regulated sector of the economy plagued with bureaucracy and complex regulations. Regulatory requirements have strongly swayed manufacturers’ decisions around investments in, and development of, new products. According to a study done for the Journal of Medical Devices, almost nine out of 10 companies surveyed felt that FDA is unnecessarily hindering innovation and decreasing American competitiveness in the global marketplace.2 The FDA review process is almost twice as long as that of its European counterpart, the European Medicines Agency, for devices not requiring clinical data, and almost three times as long for devices that do. On average the United States takes six months, whereas European countries take three months. Citizens of countries with efficient and less uncertain and complex regulatory approval processes gain earlier access to innovative medical technology, and providers in those countries benefit from more experience in using new devices. According to the group of 28 executives of leading medical device companies in the United States, China, United Kingdom, Germany, France, Brazil, Israel, Japan and India that we interviewed for this article over the course of the past year, Israel ranked first in overall ease and speed of regulatory approval (see Figure 1). 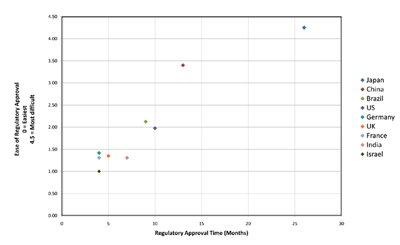 Figure 1.The regulatory approval time versus the ease of regulatory approval (Click figure for larger view). Lack of Permanent R&D Tax Credit. The Section 41 Research and Experimentation Tax Credit (known as the R&D Tax Credit) has been an essential incentive for companies to help mitigate the risk of investing in research that may not be realized in profitable products for many years to come, but will ultimately make the United States more competitive in the emerging global market. The current R&D tax credit has been extended almost yearly since it was enacted in 1981. But uncertainty created by these short-term extensions continues to discourage companies from investing in critical, long-term, high-risk research projects that have historically shown tremendous payoffs in economic growth, productivity gains, and jobs. This credit has been estimated to return $2 to the economy for every $1 of the credit, President Obama stated during the National Academy of Sciences Annual Meeting in April 2009. Throughout the 1980s, and until 1991, the United States was ranked number one in the effectiveness of the R&D tax credit among the 30 The Organization for Economic Co-operation and Development (OECD) nations. In 2008, the United States ranked 17th overall (and 19th for R&D tax credit generosity towards small businesses) amongst OECD nations, despite Congress’s expansion of the credit.4 While many countries across the globe continue to nurture local R&D efforts by buttressing these efforts with strong permanent R&D tax credits, the United States has a weak temporary credit. The future potential for U.S. economic growth driven by the medical technology industry is tremendous. Worldwide markets for medical technology will expand dramatically as populations’ age in countries across the globe. Additionally, hundreds of millions of people in countries like India and China will enter the middle class and demand modern, quality healthcare. Finally, innovative products will continuously serve as the fuel for market growth. These novel technologies could yield significant first entrant advantage and help facilitate substantial margins in bringing disruptive technologies to market. Growing and Aging Population. The world population is expected to grow and get older in the next 20 years and beyond. Demand for medical products is expected rise as the population grows, and as the growing share of elderly uses a larger share of those resources. A 2010 United Nations report estimates that the world’s population will rise from 7 billion in 2010 to an estimated 9 billion in 2050.5 By 2025, the report predicts, people 60 and older will represent more than 15% of the total population. This number is significant for the medical device industry, because the elderly use a disproportionate amount of health resources. The expanding and aging global population is expected to result in increasing demand for healthcare products and services. Scientific Progress. The medical device industry will be fueled by scientific progress in this new century of the life sciences, as fundamental discoveries and advances in computing, materials, engineering, and physics create the knowledge base for an explosive growth in the creation of new treatments and cures. Mobile health, value-based purchasing, and personalized medicine will also drive more cost-effective, outcome-based initiatives and greater collaboration among payers, providers, and the medical technology industry to develop and deliver complete patient-centered solutions. Currently, there are multiple threats to U.S. dominance in the medical device industry: the challenges posed by globalization, the increased difficulty in obtaining reimbursement, and an ever-cautious VC community. Globalization. Manufacturers are looking to the worldwide market in search of increased growth opportunities. The Chinese medical device market is predicted to expand about 15% annually during the next five years, while India’s market is expected to expand about 23%. China’s medical device sales are expected to reach $43 billion by 2020 and India’s to hit $11 billion. This shift in growth could draw the focus of multinational device manufacturers away from the United States and toward the emerging markets. Manufacturers in the emerging markets might be content with the potential for growth within their own borders and might not seek regulatory approval in the United States and other developed countries. Reimbursement. The U.S. market is so large that reimbursement decisions have the potential to affect the viability of product manufacturing for other markets. Over the next decade, reimbursement in the United States will become much more difficult to obtain, while at the same time, it will become much easier to obtain reimbursement for technologies in China, India, and Brazil. In the United States, employers as well as governments and private payers will push more of the financial risk to healthcare consumers and providers. Providers will be held more accountable for health outcomes. They will be penalized for poor quality and high cost. These drivers will lower reimbursement for medical technology. While U.S. customers are tightening spending and demanding more efficient care delivery, countries that already experience the greatest tensions in access to care and availability of infrastructure will move ahead in advancing innovative delivery and payment models. Process IT will allow better outcomes at a lower cost in China, India, and Brazil, at the expense of the United States. Attracting Venture Capital. As emerging markets grow, global VC firms will increasingly see developing nations as more attractive. Rapid growth in VC investment in China, India, and Brazil will continue to be fueled by local and U.S. investors. As a result, these countries will successfully build entrepreneurial cultures. Venture capitalists need a predictable system to assess risk. When uncertainties prevent access to VC funds there tends to be a fall-off in innovative activities. The VC community will view the U.S. market as less attractive due to the difficult regulatory environment, uncertain payment structure, and relatively weak rate of growth in R&D and resources for innovation. Venture capitalists will instead seek countries where the growth opportunity is stronger and the approval process is less costly in time and money. Because most medical technology innovation occurs in start-ups and is later acquired by larger companies, multinational companies will follow suit and increasingly look to these emerging markets for acquisitions to fill their product pipelines. A recent example of this type of activity is Covidien’s acquisition of two Israeli medical device technology companies in three weeks, according to the Boston Business Journal. The U.S. medical device industry—known for producing life-saving innovations and creating millions of jobs across the country—is facing unprecedented challenges that could prove catastrophic not only to the industry itself and to the livelihoods of its employees, but to the health of the patients who benefit every day from its technologies. Repealing the medical devices tax. The result of not doing so could be devastating to innovation, patient care, and job creation. Reforming the FDA approval process. To compete with the approval process outside the United States, the approval process must be more predictable, consistent, and timely, while continuing to assure that products are safe and effective. Working out a tax policy that acts as a stimulator of discovery. Such a policy would make the Research and Experimentation tax credit permanent and more generous, and would implement tax credits to keep R&D-based manufacturing in the United States. Across the developed world, medical device developers face multiple challenges. Emerging companies must ensure that they can survive and sustain innovation through the challenging funding climate. Companies of all sizes will need to continue exploring ways to leverage foreign markets to offset domestic challenges from emerging markets. The opportunities must offer high-growth potential to developed countries and provide more efficient and effective routes to launch new products and expedite early cash flow. As these companies continue to grow, it will be critical for them to maintain a focus on operational efficiency and effectiveness. Companies must realign into a consumer-centric future where providing successful outcomes is paramount. In other words, innovation that goes beyond the product to include the support services and data analytics. Finally, U.S. companies will need to demonstrate to worldwide markets that a particular intervention improves patient outcomes and enhances the efficiency of the healthcare system. The need to offer a complete product, including the addition of services and data as part of the complete offering and solution, exists. Real-time patient diagnostic data could prove as valuable as the newly developed medical device for some product categories. In tandem, a new device, with rich patient diagnostic data and a full array of supportive services might prove essential as the key for the future success of the medical device industry. 1. “Medical Technology and Venture Capital: A Fruitful yet Fragile Ecosystem,” Prepared by the Medical Device Manufactures Association with National Venture Capital Association, June 2009. 2. J Pietzsch, MG Zanchi, and JH Linehan, “Medical Device Innovators and the 510(k) Regulatory Pathway: Implications of a Survey-Based Assessment of Industry Experience,” Journal of Medical Devices 6, (2012). 3. D Furchtgott-Roth and H Furchtgott-Roth, “Employment Effects of the New Excise Tax on the Medical Device Industry,” September 201. 4. RD Atkinson, “Creating Jobs by Expanding the R&D Tax Credit,” (Washington, DC: Information Technology and Innovation Foundation, January 6, 2010). 5. “World Population Prospects, the 2010 Revision,” United Nations Department of Economic and Social Affairs (October 20, 2011). 6. D Wilson and R Puroshothaman, “Dreaming with BRICs: The Path to 2050. Goldman Sachs Global Economics Paper,” no. 99 (October 2003). Yair Holtzman is director at WTP Advisors (White Plains, NY) where he leads the firm’s Global Life Sciences practice and the Business Advisory Services Group and coleads the Research and Experimentation Tax Credits Group. He has over twenty years of experience as a management and tax consultant focusing on R&D in the chemicals and life sciences industries. He is a certified public accountant and holds an MBA degree from Cornell University’s Johnson Graduate School of Management, with a concentration in operations management and manufacturing. Yair has a BA in Chemistry from Brandeis University and completed post-graduate work in Chemistry at the University of Pennsylvania.